STATISTICS: THE EXPLORATION AND ANALYSIS OF DATA, 7th Edition introduces you to the study of statistics and data analysis by using real data and attention-grabbing examples. The authors guide you through an intuition-based learning process that stresses interpretation and communication of statistical information. Simple notation--including the frequent substitution of words for symbols--helps you grasp concepts and cement your comprehension. Roxy Peck is Associate Dean Emerita of the College of Science and Mathematics, and Professor of Statistics Emerita at California Polytechnic State University, San Luis Obispo. A faculty member at Cal Poly from 1979 until 2009, Roxy served for six years as Chair of the Statistics Department before becoming Associate Dean, a position she held for 13 years. She received an M.S. in Mathematics and a Ph.D. in Applied Statistics from the University of California, Riverside. Roxy is nationally known in the area of statistics education, and she was presented with the Lifetime Achievement Award in Statistics Education at the U.S. Conference on Teaching Statistics in 2009. In 2003, she received the American Statistical Association's Founder's Award, recognizing her contributions to K-12 and undergraduate statistics education. She is a Fellow of the American Statistical Association and an elected member of the International Statistics Institute. Roxy served for five years as the Chief Reader for the Advanced Placement (AP) Statistics Exam and has chaired the American Statistical Association's Joint Committee with the National Council of Teachers of Mathematics on Curriculum in Statistics and Probability for Grades K-12 and the Section on Statistics Education. 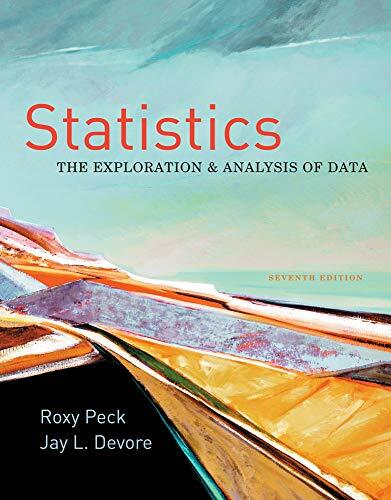 In addition to her texts in introductory statistics, Roxy is also co-editor of "Statistical Case Studies: A Collaboration Between Academe and Industry" and a member of the editorial board for "Statistics: A Guide to the Unknown, 4th Edition." Outside the classroom, Roxy likes to travel and spends her spare time reading mystery novels. She also collects Navajo rugs and heads to Arizona and New Mexico whenever she can find the time. Peck, Roxy; Devore, Jay L.
Peck, Roxy, Devore, Jay L.